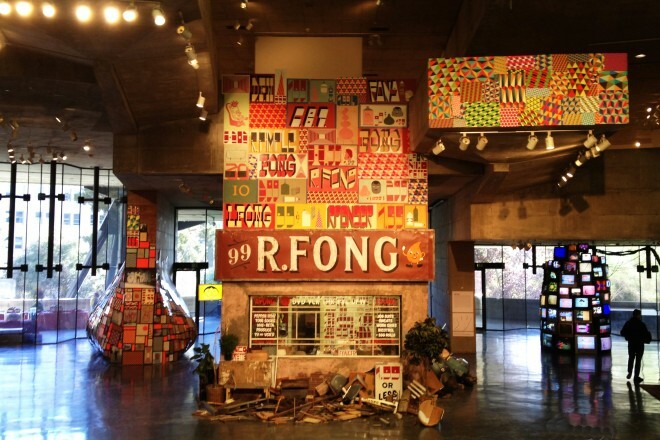 On view until December 9th, Barry McGee at the Berkeley Art Museum, 2626 Bancroft Way, Berkeley: This is the first mid-career survey of the San Francisco based artist and showcases the astonishing range of McGee’s compassionate and vivacious work. The exhibit features work by “Twist” as well as “Ray and Lydia Fong” – both monikers McGee has used in his work on the streets and in galleries over the years. McGee graduated from the San Francisco Art Institute and uses a visual vocabulary drawn from graffiti, comics, hobo art and sign painting. His work celebrates his Mission District neighborhood and is infused with social activism. With installations that break the boundaries of the Museum’s walls along with animatronic taggers throughout, this is a must see exhibit. Installation view at the Berkeley Art Museum. On view until September 29th, Microblast at Project One, 251 Rhode Island Street: Microblast features work by Jet Martinez and Kelly Ording, both well known for their public art murals and their studio art practice. This is the couple’s first combined exhibit, reflecting a creative and personal bond between two artists whose work intersects and converges as they pursue similar themes, motifs, and interests. Both having completed large-scale murals at Facebook’s headquarters recently, this exhibit showcases their more intimately-scaled paintings and works on paper. The gallery hours are Tuesday – Friday, 11am to 5pm. Saturday September 15h, The Art of Graffiti Class by Nate1, 12:30 – 3:30, First Amendment Gallery, 1000 Howard Street: Feeling inspired after seeing street art in the galleries? Study the history of graffiti under one of San Francisco’s graffiti legends, Nate1. You’ll go on a mural walk to see landmark pieces and observe how graffiti art has changed over time. Under the guidance of Nate1, You’ll receive introductory knowledge of the spray can and have a brief hands-on session spent sketching letters and discovering your personal style. This class includes a complementary black book for sketching! 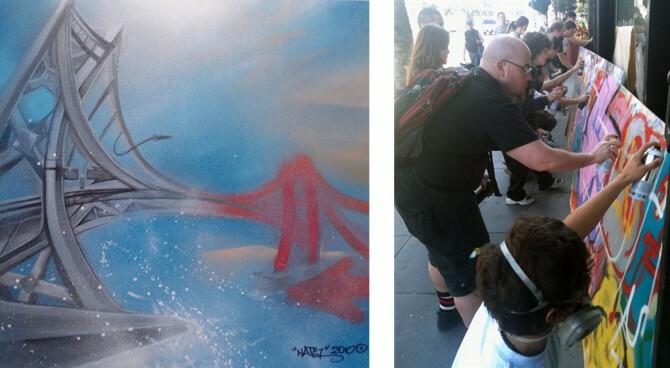 “Bay Bridge War 2” by Nate1. Students learning in “The Art of Graffiti” class.